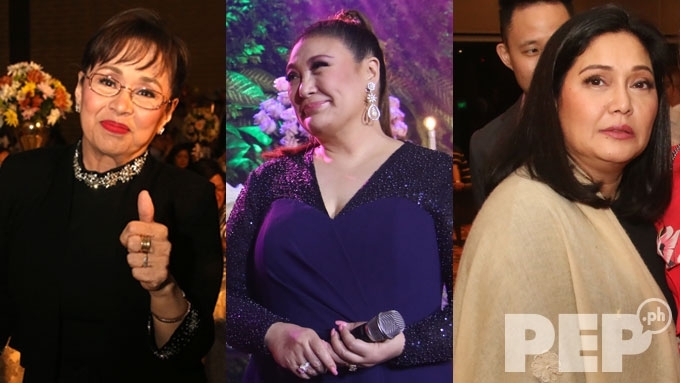 Truly a star-studded affair, Mother Lily Monteverde's 80th birthday was headlined by showbiz icons Star For All Seasons Vilma Santos, Megastar Sharon Cuneta, and the Diamond Star Maricel Soriano. 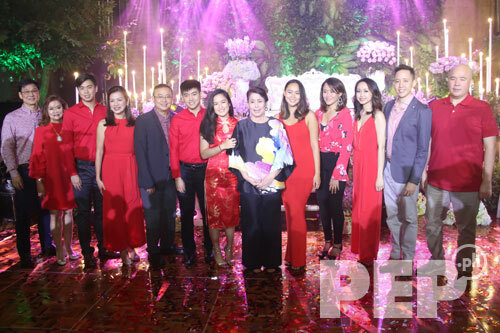 Though she is rarely seen in showbiz circles given her duty as Batangas representative, Vilma made time for Mother Lily's party. Asked about Mother Lily wanting her to play the Regal Entertainment matriarch in a movie, Vilma quipped it's going to be a very challenging role. "Kung isasapelikula yung buhay ni Mother baka hindi ko tanggapin, e. Hindi ko kayang gawin si Mother, kasi nag-iisa lang si Mother. Hindi ganun kadali." 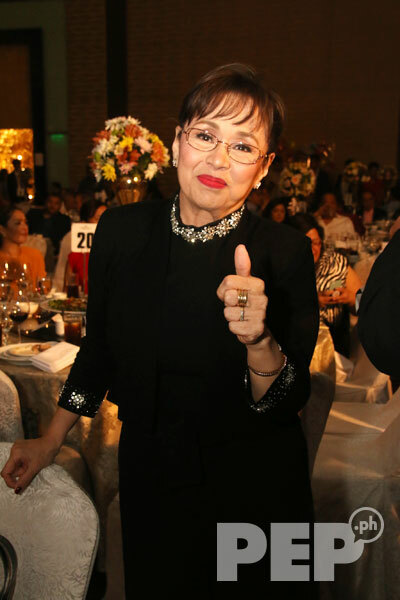 Talking about Mother Lily's unpredictable temperament, Vilma cheerfully added, "Hindi ko kaya yung kay Mother na tumatawa ngayon 'tapos in one minuite galit. "'Tapos nasa sulok umiiyak na. 'Tapos flying cellphone! 'Tapos mamaya, masaya na naman siya. Iba siya, e! Iba siya! Kaya nandito kaming nagmamahal sa 'yo." 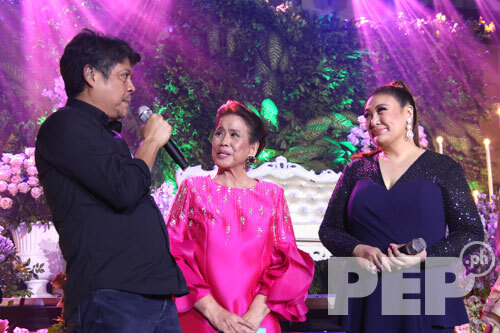 In a brief chat with PEP.ph, Sharon Cuneta attested to how Mother Lily stood by her during the low points of her showbiz career. Recalling how Mother Lily had always believed in her, Sharon said, "Because really, without us asking for anything, you're always there for us. "I'll never forget, when I was at my fattest and no one was minding me, you're the only one who offered me a movie. "And although I did justice to that role—I'd like to believe—I wish I was thinner, because I should have given you my best even physically. "But even then, Mother, my love for you would always be here. I would always be proud of the fact that I, for a while, became a Regal baby. I love you, Mother." 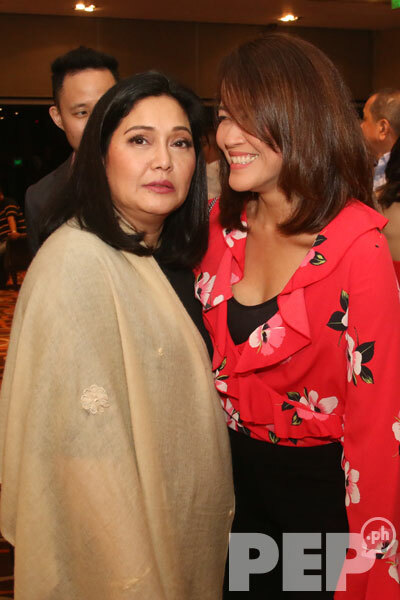 Maricel Soriano was seen chatting with Regal Entertainment's lady boss Roselle Monteverde before entering the grand ballroom of Crowne Plaza. It was just last April when she co-starred in Regal Films' movie My Two Mommies together with Paolo Ballesteros and Solenn Heussaff. 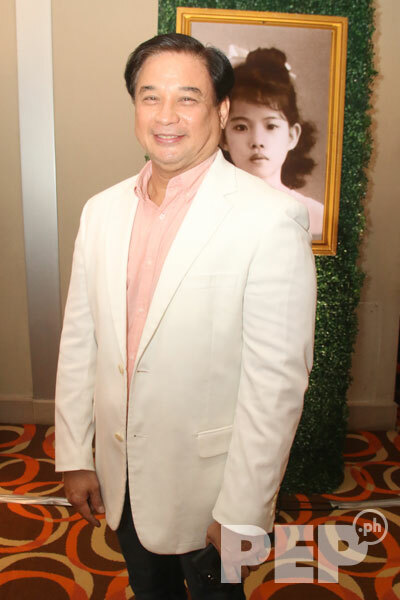 An original Regal baby, Gabby Concepcion told PEP.ph that Mother Lily launched him in the 1980 coming-of-age film Katorse, which starred Alfie Anido and Dina Bonnevie. 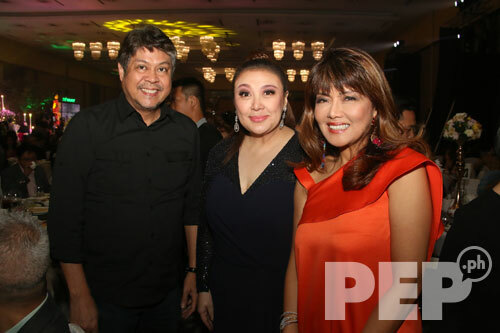 On a side note, Gabby arrived at the party only a few minutes after Sharon left with husband Senator Kiko Pangilinan. 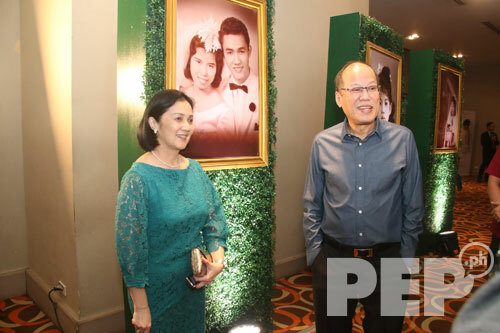 In a rare appearance, former President Benigno "Noynoy" Aquino III arrived at the party with sister Ballsy Aquino-Cruz. 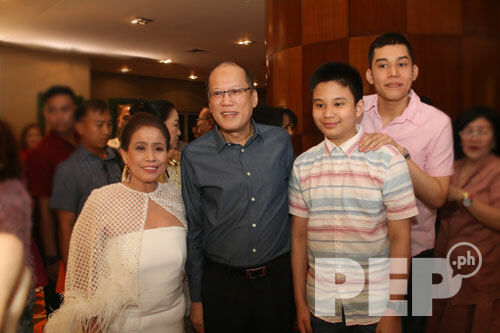 They were joined by Kris Aquino's sons Josh and Bimby, who were happy to see their uncle Noynoy at the event. Right before the program started, their group caught up with no less than the birthday girl herself. When Mother Lily asked why Kris couldn't make it, Bimby explained that his mom was feeling under the weather. 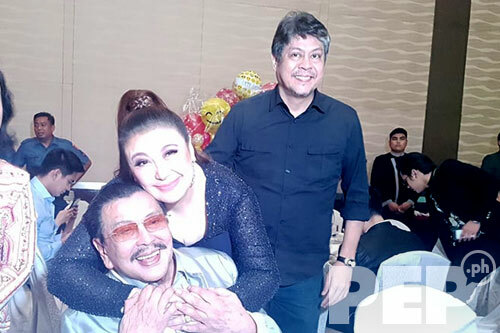 Sharon gave Manila Mayor Joseph "Erap" Estrada a hug and a kiss as they briefly caught up with each other at the party. Kiko, for his part, happily escorted Sharon while she was acknowledging close friends she have not seen in years. 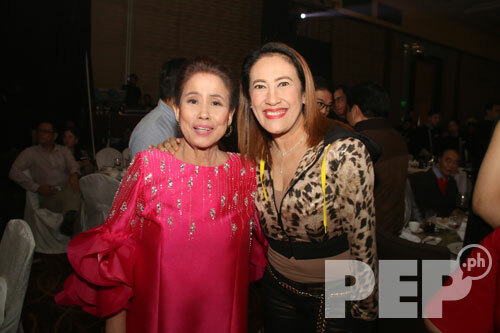 Ai-Ai delas Alas personally greeted the birthday girl, who produced the Comedy Queen's box-office movie Our Mighty Yaya in May 2017. Mother Lily then threw a thanksgiving party where she happily told Ai-Ai, "You made me rich again!" 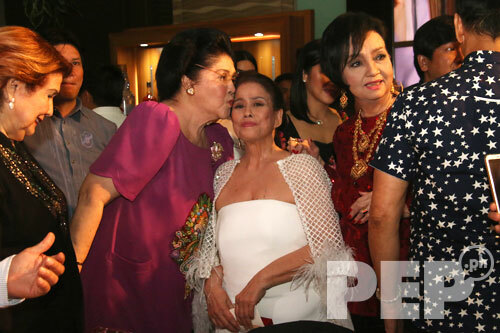 Former first lady Imelda Marcos gave Mother Lily a kiss on the forehead. 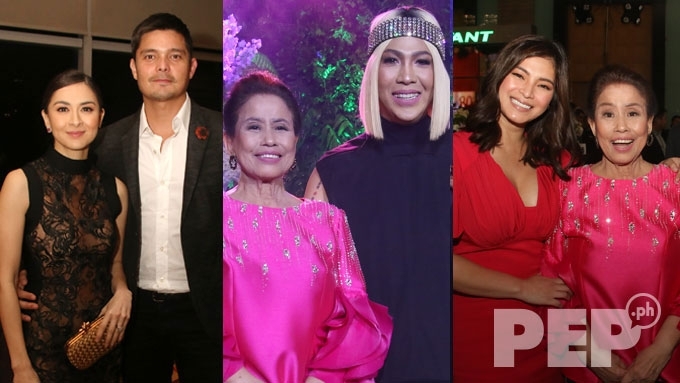 While mingling with the guests at Mother Lily's party, the Megastar and Senator Kiko bumped into Ilocos Norte Governor Imee Marcos. 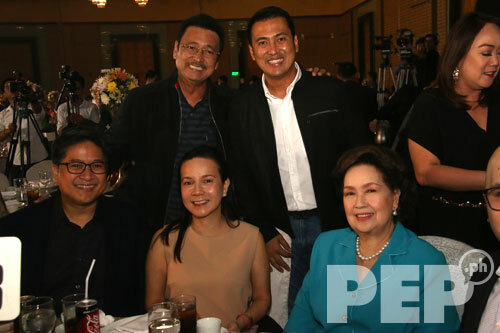 Former Senator Lito Lapid and his son Mark exchanged pleasantries with Susan Roces, Senator Grace Poe, and Senator Grace's husband Neil Llamanzares. 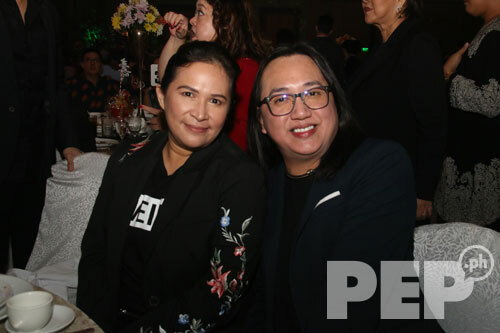 Janice de Belen was accompanied by her manager Popoy Caritativo. Asintado star Lorna Tolentino was among the early birds. 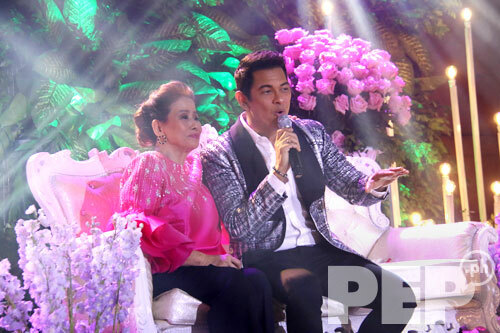 Gary Valenciano serenaded Mother Lily with his hit song "Sana Maulit Muli" at the latter part of the program. In between his song numbers, Gary assured the guests that he is feeling better after going through several health issues from April to early July this year. Actor-director Ricky Davao, who is currently busy with GMA-7 prime time series Inday Will Always Love You, made it to event. 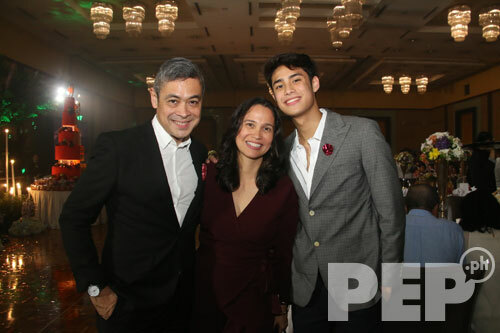 Anthony Pangilinan and Maricel Laxa came with their son Donnie. 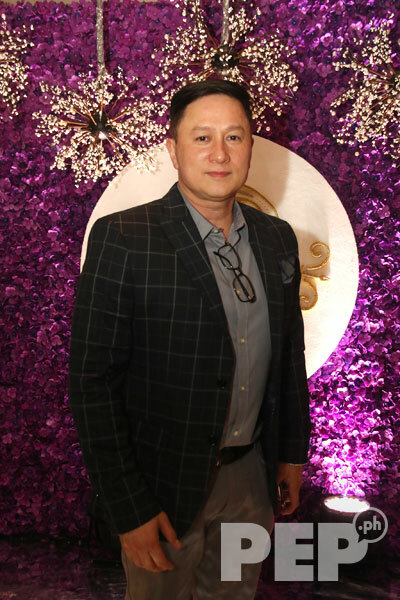 Eric Quizon was among the guests who stayed until the program was nearly finished. 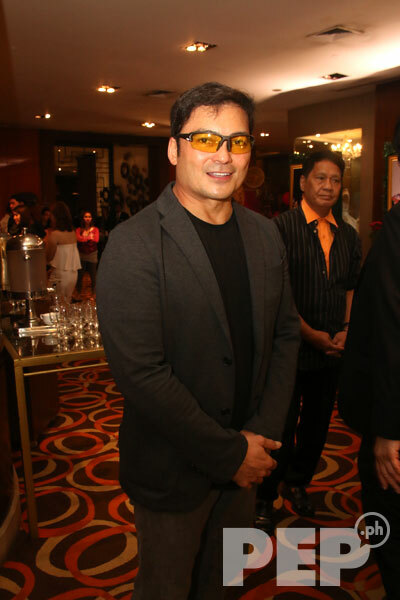 Sharon was overjoyed when she saw her favorite director, Chito Roño, as she was about to leave the party. Jenine Desiderio performed a song number. A natural performer, Mother Lily wowed guests with her opening dance number. The program ended with Mother Lily having a photo op with her family.